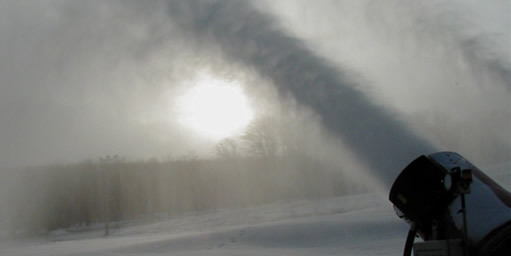 THE BASIC OBJECTIVE OF SNOWMAKING IS TO ATOMIZE WATER INTO DROPLETS, BLOW THE DROPLETS UP INTO THE AIR, ALLOWING THEM TO SUBSTANTIALLY FREEZE BEFORE THEY CONTACT THE GROUND (HOPEFULLY ON THE SKI TRAIL). THE SMALLER THE DROPLETS, THE FASTER THEY WILL FREEZE. THEREFORE ON A WARM DAY YOU WILL BE RUNNING THE GUN LEANER, PRODUCING FINER DROPLETS IN ORDER TO MAKE SNOW, THUS MAKING SMALLER PILES THAN ON A COLDER DAY. THE PROCESS OF MAKING SNOW CAN BE A BALANCING ACT BETWEEN THE FOLLOWING FACTORS IN ORDER TO MAKE GOOD SNOW. TEMPERATURE, RELATIVE HUMIDITY, AND ALTITUDE CAN BE COMBINED INTO A SINGLE FACTOR CALLED “WET-BULB TEMPERATURE”. THIS IS THE TEMPERATURE A WET THERMOMETER WILL COOL TO IF AIR IS BLOWN OVER IT – A CONDITION SIMILAR TO WHAT THE WATER DROPLETS ARE BEING EXPOSED TO DURING SNOWMAKING. WHEN THE AIR TEMPERATURE IS NEAR FREEZING, THE WET-BULB TEMPERATURE BECOMES VERY IMPORTANT. IN FACT WITH THE RIGHT EQUIPMENT, SNOWMAKING CAN TAKE PLACE AT 40 DEGREES FAHRENHEIT (+4.4 DEGREES CELSIUS) IF THE RELATIVE HUMIDITY IS LOW ENOUGH TO YIELD A WET BULB TEMPERATURE BELOW 32 DEGREES FAHRENHEIT (0 DEGREES CELSIUS). THIS MAY SEEM A BIT BIZARRE, BUT THE WEATHER IN THE WESTERN US FREQUENTLY ALLOWS THIS. FROM A PRACTICAL STANDPOINT, THE KEY TO EFFICIENCY IS THE AIR TO WATER RATIO AT A GIVEN WET-BULB TEMPERATURE. THE BEST WAY TO PREDICT SNOWMAKING WEATHER IS TO WATCH THE DEW POINT UPWIND IF THE SURROUNDING TERRAIN IS FROZEN. THE DEW POINT IS THAT TEMPERATURE AT WHICH WATER WILL START TO CONDENSE OUT OF THE AIR. WHEN THE TERRAIN UPWIND OF YOU IS FROZEN (INCLUDING ANY BODY OF WATER), OR UNLESS IT GETS WARM ENOUGH TO MELT THE SNOW, THE DEW POINT OF A LARGE AIR MASS TENDS TO BE FAIRLY CONSTANT THROUGHOUT. THIS MEANS THAT IF YOU ARE MAKING SNOW AT NIGHT, WHEN THE SUN COMES UP IN THE MORNING, THE TEMPERATURE RISES AND THE RELATIVE HUMIDITY DROPS. THE WET BULB TEMPERATURE GOES UP SLOWLY AND THE DEW POINT IS CONSTANT THROUGHOUT THE DAY AND NIGHT. YOU CAN OFTEN CONTINUE TO MAKE SNOW WITHOUT CHANGE UNLESS THE TEMPERATURE RISE IS TOO GREAT. THE REAL CHANGE IN SNOWMAKING WEATHER IS WHEN A NEW AIR MASS MOVES THROUGH AND THE DEW POINT SUDDENLY CHANGES. OF COURSE IF THE TEMPERATURE GOES UP ENOUGH TO MELT THE SURROUNDING TERRAIN, THE DEW POINT WILL ALSO GO UP AND SNOWMAKING CONDITIONS WILL DETERIORATE. A GOOD WIND IS CRUCIAL TO A GREAT NIGHT OF SNOWMAKING. THE BOTTOM LINE IS YOU CAN’T FIGHT THE WIND AND IF YOU TRY YOU WILL LOSE. WE NEED TO AIM THE GUNS WITH THE WIND AND CONTINUALLY MOVE THE GUNS AS THE WIND CHANGES TO GET THE SNOW TO GO WHERE WE WANT IT. OUR SNOWMAKERS ARE OFTEN WATCHING THE WIND WHEN TESTING SNOW QUALITY AS IT FALLS ON THEIR ARM. A SUDDEN GUST CAN CHANGE THE APPARENT SNOW QUALITY FROM ONE SECOND TO THE NEXT. IN VERY WARM WEATHER OR WINDY CONDITIONS THE ONLY VALID MEASURE OF SNOW QUALITY IS TO TEST WHAT HAS ACTUALLY FALLEN ON THE GROUND. GRAB A HANDFUL OF SNOW AND SQUEEZE IT TO SEE HOW MUCH WATER THERE IS IN IT. ELEVATION OR ALTITUDE OF THE GUN IS IMPORTANT TO GET THE WATER MORE HANG TIME SO IT CAN FREEZE BEFORE IT LANDS ON THE GROUND. OUR GUNS HAVE POWERFUL FANS THAT BLOW THE WATER DROPLETS HIGH INTO THE AIR. WE AIM THE GUN UP AT ABOUT A 35 DEGREE ANGLE. THIS ALLOWS YOU TO PUT MORE WATER TO THE GUN, THUS BIGGER PILES OF SNOW! YOU MAY WONDER WHY WE DON’T PUSH OUR PILES OF SNOW OUT RIGHT AWAY. IT IS IMPORTANT TO TRY TO LET THE SNOW SET UP BEFORE GROOMING IF POSSIBLE. MAN-MADE SNOW IS DENSE ENOUGH, IT DOESN’T NEED TO BE COMPACTED. THE FIRST DAY IS THE MOST IMPORTANT. ICE INSIDE THE SNOW MASS IS CONTINUALLY SUBLIMATING (EVAPORATING DIRECTLY FROM A SOLID) AND RECRYSTALLIZING INTO A BONDED MASS. GROOMING TOO SOON WILL COMPRESS THE SNOW, SQUEEZING OUT AIR POCKETS IF THE SNOW IS NOT ALLOWED TO SET UP FIRST. THIS IS WHERE LAYERING THE SNOW WITH A DRY LAYER ON TOP CAN HELP REDUCE THE NEED FOR GROOMING. WE TEND TO MAKE THE BEST SNOW WHEN THE TEMPERATURE IS IN THE LOW 20’S AND THE HUMIDITY IS LOW AS WELL. BECAUSE SNOWMAKING IS SUCH AN EXPENSIVE PROCESS WE OFTEN HAVE TO MAKE A CALL ON MARGINAL NIGHTS OF SNOWMAKING ON IF IT IS WORTH IT TO DO OR NOT. ON A NIGHT W/ THE TEMPERATURE AT 25 DEGREES AND THE HUMIDITY OF 80% OR HIGHER WE WOULD NOT MAKE THAT MUCH SNOW BUT ON A NIGHT THAT IS IN THE TEENS OR LOW 20’S WITH A HUMIDITY OF LESS THAN 50% WE COULD MAKE PILES IN UPWARDS OF 5-8 FEET DEEP IN JUST TWELVE HOURS.